Meeting or spending time with people who inspire me. If you want to do something, but you're not in the perfect place to do it, find a way. It means adapting. 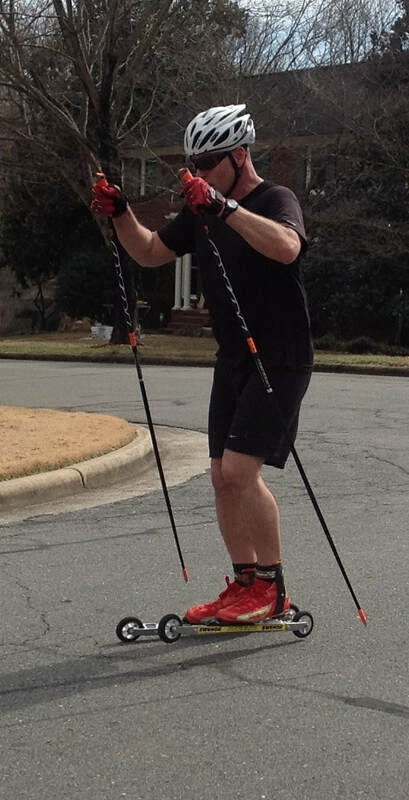 I'm really enjoying my new hobby of roller cross-country skiing. Not a lot of snow down here in NC but adapting to the environment and finding a way to make it happen is something we can all do. Learning a new technique is really fun and really challenging. Go get it, whatever it is you want and be flexible! Struggle - It's what we should strive for. So I know I have seen headlines to articles that read, "The struggles of..." You name it, whatever pursuit in life and someone talks about the struggle that they endure. For me, there is always a first impulse, a feeling that kind of stops me and there is momentary feeling of anxiety. It must be my empathy that kicks in. But then, I finally realized that to struggle is a good thing. Well, let me get more specific. The articles that I am referring to are about some kind of mental struggle and not a physical struggle- one that would actually endanger ones life. But the mental struggle, say of how are you going to handle that busy day or week you have coming up for example. Struggle, what a great word when talking about a mental challenge. Or, a planned physical challenge, either way to struggle is good. If you are really going to honor the definition, then you really are in for a bout. And in any real challenge, you don't know the outcome. You may not have any definitive proof that you are going to come out on top. Not being sure, is such a great place to be. Yet so many don't want to go near that place where they actually do not know the outcome. Getting comfortable with not knowing is a great mental strength. We should strive to put ourselves in a situation where we truly have to struggle to achieve success. That is uncomfortable. So, imagine if you faced a true struggle or even put yourself in a situation where you really had to struggle to succeed. That is what it's all about. That is real living! I capped off practice on Sunday with a few words that I hoped would reach everyone in some positive and hopefully thought provoking way. I wanted to recap for those of you who were not there. First, I am super excited every time I look at the group and see how we are developing and reaching new levels. With masters nationals coming up here just weeks away, open water right around the corner as well as triathlon season, it will be time to put ourselves on the starting line and go. Go time! That's what I like to say. My main goal is to have you at the starting line feeling like you have an opportunity to unleash your effort and go for a personal best performance. Hitting the starting line balanced in thought, putting all your desires, expectations, jitters and anything else aside for that special time of getting in your PUSH Zone. The PUSH Zone is where you don't evaluate yourself or your performance. It is were you focus 100 % of your energy on letting your body do on a subconscious level what you have thoughtfully and deliberately trained it to do. Being in the PUSH Zone (I may have to copyright that term!) is beautiful to feel and for me to observe as your coach. Now here is a list of vocabulary words for you. These are my definitions - your choice to buy into it or not. Darn right I hope you choose to buy in! Pain - this is what we feel from an injury - you don't push through it. Feedback - this is the sensation you feel when you are pushing your limits - characterized by burning muscles and lungs - greet it, look forward to it because no great performance comes without it! Choice - We choose to pursue athletic goals - no one makes us do it. From a weekend warrior to a highly paid pro athlete, it is our choice to put ourselves through any athletic event. When you really think about it, achieving our goal or getting a multimillion dollar contract benefits only you. Sacrifice - This is what firefighters do when they go into a burning building to save someone knowing full well they may not come out. The same for other rescue type workers or those who intend to help someone else. Normal - Coming into frequent contact with a variety of people of all ages, my observation is that the normal is a tendency to avoid more than mild physical exertion. In this sense, when I see you day after day at the pool, on the track, on the road or in the gym pushing it, you are outside the norm. In my eyes you are the folks that I want to be with. Slap In the Face - for the good! I am a firm believer that a slap in the face is a good thing. Well, figuratively speaking that is. Everyone needs one once in a while. I welcome them myself. The known behavior regarding health is that for most people to change their lifestyle there has to be a drastic life-threatening event such as a heart attack. So many folks will ignore every warning sign and deny that their actions are putting them on a trajectory heading to the bullseye on the disaster target. Today, in my humble opinion there are a multitude of well placed disaster targets in every direction. Look anywhere and you will see them. Let's start with food. What are my food options? We know we need to eat. What are you going to eat? Hmmm, fast convenience. Fast food! Once in a while - ok. (My definition of once in a while by the way is - 1-2 x per month.) Consume fast food to often and you will pickle your insides and take in so many unneeded calories that you will alter your body mass in an unfavorable way. While poor food choice intake can represent a hitting a disaster target in the physical sense I believe that listening or consuming to much media can represent a psychological disaster target. Sure there is great journalism somewhere, but most of it is packaged to evoke a reaction or support a narrow viewpoint that makes folks feel as though someone else understands your particular point of view. In a quick sample of news media, I see and hear so many stories where negativity thrives. Check this yourself. When you watch the news how does your stomach feel? What is the expression on your face? These seemingly simple things can tell you a lot, but you have to be objective and a bit self-analytical. What can you do about all this? Well, as I told a group of my regular athletes who I was training this morning at 6AM who swim in my masters swimming workout. 1) Attitude is everything. What we do and how we do it and what our attitude is while doing it is important. When you choose to do something, do it right, with a smile on your face even! (Exercise is good!) 2) Do a quick and brutally honest review of yourself. Do you do anything like smoke and eat fast food to often? Can you really justify either? Now, I'm not judging, I'm urging you to ask yourself. I ask myself all of this constantly - FYI. 3) Find a positive thing or habit in your life and replicate the system and/or thought process that makes that positive behavior a habit. Apply the same approach to anything you want to change. When you look around you and see what you see and hear what you hear, make sure look at it objectively. And just because something everywhere, like a fast food joint, resist the idea that it's ok to indulge and find yourself eating there frequently. (Frequently = more than 1-2 x per month.) Look at whether a behavior or accepted attitude that manifests itself creates any good for you or someone else. If not, then why maintain it? Finally, I embrace the idea that we should question everything around us. Especially those things that we believe are common place, accepted or important. In my opinion - the most important things in life are, health of body and mind. It is therefore essential that we limit our consumption of very accepted, common place things as basic as food and even the news media. Be healthy, be objective, make good choices. I've been intrigued and amazed for decades by the concept of PEDs. PED stands for Performance Enhancing Drugs. Somehow, even as a young competitive athlete who I will say built my self worth and very existence, based on how well I thought I did in my chosen sport, I never reached for a PED or took any. That said, I witnessed other athletes take them. I talked to them about it. I was amazed. Why? I first learned about PEDs from a friend of mine back in 7th or 8th grade. His older brother was a star athlete and they told me that some athletes took steroids. "Steroids, what's that?" I asked. They also said that steroids made you big and strong. But the downside was that they also made parts a guy shrink. Baffled, I thought, "what, why would someone...?" So current day, I see full blown high profile cases of athletes using. In different sports, with both sexes relying on them for performance and paycheck, I ask what is real? I think athletes all have to ask themselves what is real and what do I want to do with myself. More so, we should look into the future and ask ourselves, when I look back on my athletics, what do I want to see? What do I want to learn from my experience? What do I want to say to others and what do I want to say about myself? PED use to me represents a short term outlook. An "I've got to get this now," and never mind tomorrow kind of mindset. But tomorrow when you are asked about that performance, what will you say? From what I see, athletes who win with drugs will usually lie about it - at least for a while, but maybe forever. That is something that goes against the very idea of personal search for exploring your own personal limits. Is that worth it? It also represents some kind of entitlement i.e. the "I deserve this" kind of attitude. Those who make the argument that they indulge to keep up with the other athletes in their sport who they believe are indulging is pure bs to me. As a coach, I say, go out and compete. Find out who and what is out there. But find our where you truly are in the arena. You will always have that piece of mind of who you really are and what you are truly capable of. That in itself is priceless. This past weekend my masters swim team (TYDE Endurance and Aquatics Masters - TEAM) had it's first meet here in North Carolina. Held at an exceptional facility, the Greensboro Aquatic Center, we got a taste of fast water. Masters National Championships will be held at this pool in April 2016 so this was a great chance for us to get accustomed to the facility. TEAM had about 15 athletes attend and each athlete experienced something great. In viewing the athletes behind the blocks, in the water and then hanging out between events, I was very pleased with everyone. Pleased especially with the focus to step up go at it. Our mindset was "all in" when we raced. All in means we were focused and ready to fight for that great performance. Many athletes achieved best times. Every race is a highly valuable experience. In the good races, you need to look at what you did right. In the other races, you look where you can improve. There is NO BAD SWIM! We have our next meet in January '16 and I am looking forward seeing everyone out there again as we go "all in" and compete. I am proud of my group! Although, you can prepare for an endurance event it a matter of weeks, reaching a new level in endurance and performing well in endurance events is a year round pursuit. However, that doesn’t mean that you should try to hold peak fitness year round with high intensity, training volume and frequency. Being totally committed to the sport actually means that your annual training plan looks drastically different depending on the month. Recovery and rest are often scorned words to more endurance athletes than need be. Recovery and rest should be a part of every athlete regardless of level. But, that saying that came out years ago, “go hard or go home” unfortunately lives on. You will need to push through some very challenging workouts in order to make fitness gains. No doubt, but not every training day. One key term to become familiar with is periodization. The concept of periodization in training has been around a long time. With its origin in the former Soviet Union it involves a careful and planned manipulation of training variables. Why the Soviets? What did they know? Well a lot, but it’s also what they had that allowed them to pioneer training methods. In short, they could operate as a sports factory plucking anyone from where they were (family, city, etc) if they recognized that there was an aptitude for a given sport. If “they” wanted you to participate in “the program”, you pretty much participated. We think you are a shot putter, you train that way. We think you are a gymnast you come a train for it. They could collect good data though from their athletes with great control over other variables too. Due to the highly structured environment and governmental control their data obtained regarding the human responses to training stimuli was good. From what I can tell, all of my athletes have plucked themselves out of the main stream of sedentary lifestyles and have entered into their own “program.” It is by your own choice that you are participating in endurance training and events. Your internally motivated pursuit is the best foundation for success. Now it’s time to go about your pursuit in the best possible way. This involves applying the concepts of periodization. How? Either study training methodology and apply what you learn to your program design or seek to work with a coach. A coach should create a program that is specific to you, your needs and your goals. Your training program needs to focus on the development of your energy systems through careful planning. You also need to consider how well your body is currently moving. Does your musculoskeletal system need to be addressed? Are you at a level of biomechanical efficiency that makes yards of swimming and miles of cycling and running safe for your future health? With the training volumes that endurance athletes subject themselves to, there must be plan. When you plan successfully, there is arguably a lower chance of developing chronic injuries and there is certainly a greater decrease in rate of psychological burn out. And on the positive side, you give yourself the best chance of achieving peak fitness and a best performance at your goal event. This is a conversation that I am excited to have. In fitness and our chosen activities, I think that so many folks need to take a slow, but deliberate approach. ie build or progress slowly with consistency while building frequency, duration. Committing for the long-term is the only way. However, our entire social system is more geared to the opposite. More often I witness a get it now, get as much as you can and disregard everything else type of approach. Whether we are seasoned as athletes with years of training or whether we honestly just want to take our first try at a fitness or competitive activity (at any age) we will do best when we have RESPECT for our bodies. Most of the time it's the only body we have although there is such a thing as joint replacement. (OEM is really the best though) - however, I do have a dear friend who had a heart transplant at a young age... But I digress. You, yourself regardless of your current state of being, along with the way you move and the attitude you display in your fitness pursuit can be just as inspirational when exhibited in a thoughtful committed exercise program or to a chosen activity. David Amato is a coach who encourages applying what we learn in sport to life.